Vincent Price is back again." 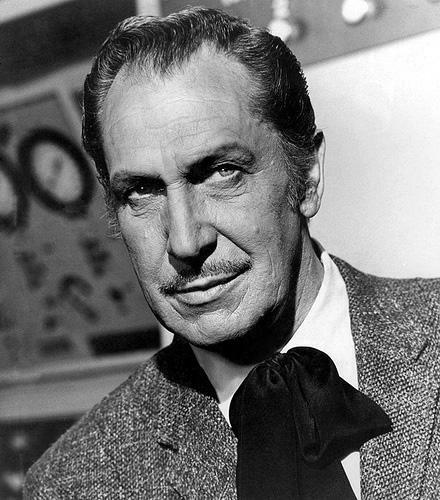 — Deep Purple, "Vincent Price"
Vincent Leonard Price Jr. (May 27, 1911  October 25, 1993) was an American actor from St. Louis, Missouri. He is best remembered as the villain of such horror classics as House of Wax, House on Haunted Hill, The Masque of the Red Death, The Pit and the Pendulum, and The Abominable Dr. Phibes. He possessed a very distinctive voice and the most twirlable mustache you ever saw on a living person. He also provided the creepy narrator voice and Evil Laugh in Michael Jackson's "Thriller" and Alice Cooper's "Devil's Food." On the 1960's Batman TV series, he had a semi-recurring role as the world's greatest criminal mind, Egghead. He was one of only two villains (the other being King Tut) to deduce Bruce Wayne's secret identity. He also voiced the Diabolical Mastermind of The Great Mouse Detective, Professor Ratigan (which he would later say was one of his favourite roles). In addition, in 1971 he spent a few days in Canada doing segments for that goofy mainstay of Canadian kids TV, The Hilarious House of Frightenstein; his segments were distributed among the series' impressive 130-episode run. In the 1970s he also lent his face and name to a number of novelty products, such as a kit that allowed kids to create their own shrunken heads (using only apples, unfortunately) which was advertised in comic books throughout the 1970s. With the possible exceptions of Boris Karloff and Peter Lorre, Price has the most homaged and imitated voice when it comes to evil cartoon characters. Hell, he's even lent his voice to some homages: he appeared in The 13 Ghosts of Scooby-Doo as Vincent van Ghoul and narrated Tim Burton's animated short film Vincent. His other television credits include hosting the 1980s PBS series Mystery! and the 1950s Game Show turned interview show ESP. Price was good friends with the two great Hammer Horror actors, Christopher Lee and Peter Cushing, and starred alongside both of them in various films. Strangely enough, Lee and Price had the same birthday (27 May), and Cushing's birthday was the day before theirs.note Though they were not born in the same year; Price was the oldest, Cushing was born two years (less one day) later, and Lee was born nine years (and one day) after Cushing. One of his closest friends was the above mentioned Peter Lorre, whose eulogy Price read at his funeral. Highly eccentric, he considered his guest appearance on The Muppet Show a "tremendous honour" (before the show really became a worldwide sensation), in a similar manner to how major musical artists know they've "made it" when "Weird Al" Yankovic parodies their songs. Affably Evil: In most of his roles. Awesome, Dear Boy: Accepted the role of Professor Ratigan in The Great Mouse Detective, simply because he had always wanted to voice a villain in a Disney movie. He would even go on to call it one of his favorite roles. Bi the Way: He was married more than once to different women; his daughter, Victoria, went on record to say that she is "as close to certain as I can be that my dad had physically intimate relationships with men." He generally was very supportive of LGBT rights. Black Comedy: Ladies and gentlemen, "How To Cook A Small Boy ". Classically Trained Extra: Price was trained in classical theater, did a stint with Orson Welles' Mercury Theater company before moving into films and performed a one-man theater show as Oscar Wilde later in his career. He loved Theatre of Blood for giving him the chance to perform Shakespeare, albeit while murdering his costars! Driven to Madness: His characters are often forced into insanity by various tragic circumstances. Evil Laugh: One of the undisputed masters of this trope. Famous Last Words: On a technicality, at least. He voiced the character Zigzag in The Thief and the Cobbler, which went through a particularly long Development Hell and wasn't released until after his death. Thus, his final words on film are "For Zigzag then, it is the end." Faux Affably Evil: He played Affably Evil roles in most of his roles, but not always. Ratigan is the biggest example, at least to Disney fans. Matthew Hopkins in Witchfinder General has only the thinnest veneer of manners, and was sufficiently sadistic to seriously disturb Price and make him regret agreeing to do the role. His character in The 13 Ghosts of Scooby Doo is pretty much just Price playing himself with magical powers. When acting, Price was known to do exaggerated Shakespearean gesticulation. He also did it when he voiced The Great Mouse Detective's Big Bad, Prof. Ratigan (his favorite role), so the animators sketched him during voice-over sessions and animated the poses into Ratigan. Though he was capable of nuance, Price's characters tended to be larger than life, but thankfully not cheesy. Usually not cheesy. In Theatre of Blood, he took the cheese to eleven, and for good reason. In the 1951 His Kind of Woman, Price co-starred with Robert Mitchum and Jane Russell, playing an Errol Flynn-style matinee idol who, when he helps Bob fight mobsters, gets a huge rush from real-life peril and leaps into the fray loudly spouting Shakespeare. Ham and cheese with plenty of relish. Professor Ratigan lives this trope until the climax, in which he turns into a vicious rat who tries killing the protagonist by knocking him from Big Ben only to fall himself. Lean and Mean: His lithe build was a recognizable part of his image. No Celebrities Were Harmed: When Sesame Street patterned the "Vincent Twice, Vincent Twice" Muppet on his physical features, he was ecstatic and considered it a great honor to have his likeness made into a Muppet. Marvel superhero Doctor Strange (Stephen Vincent Strange) is based on Vincent Price's appearance. Not Even Bothering with the Accent: Price was born in St. Louis and trained for the stage in London; he varied the resulting accent only a bit to play characters from all over the United States and England. Pungeon Master: In the '60s Batman show. His character used an absolutely egg-scrutiating number of puns that is only rivaled by that of Arnold Schwarzenegger in Batman & Robin. Playing Against Type: In Edward Scissorhands, he plays the Inventor note (who you'd expect, especially with Burton behind the camera, to be a stereotypical gothic Mad Scientist) as a kind and well-intentioned man. In an oddly fitting twist, this ended up being Price's final (filmed) role before his death. In another case, his portrayal of the goofy mainstay in Hilarious House of Frightenstein. Villain Protagonist: Played a good number of these.